We've been in a study of God's great Grace over the last few months. We've seen His Grace is greater than all our failures and just how forgiven we are in Him. We have also addressed the issues of confession and repentance. When we address our total forgiveness in Him, It opens up more of the deep truths of our redemption in Him. 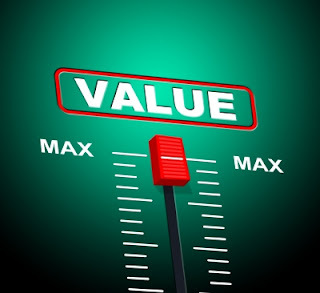 One area I feel impressed to share today is our great value. Did you know just how valued you are to God? Look how Jesus described the World. We are that hidden treasure. God made man. Man fell. God so longed for the work of redemption to reconcile back His creation. In our Father's eyes, we were so valuable He paid for us by giving His Son. We are precious and adored in His sight. Our Father God rejoices over us with joy. If our Father God had a refrigerator in Heaven, believe it, your picture would be on the front of it. For God so loved the World He gave His only Son. Now, in our own eyes, we don't always feel so valuable. We look at our sins and shortcomings. We see our mistakes and misdeeds. We see our flaws. We know the struggles, the addictions, the wrong thinking we deal with. How can we be so valuable in His eyes? Traditional religion is quick to compound these thoughts of inadequacies. They see sin and the mistakes of people. They conclude we are unworthy. We are not fit to stand in the presence of the King. We are unrighteous and unholy. They will continually point this "truth" out to us. Think of this. When are we considered holy? When I was in Grace-free religion, I never saw myself as holy. I knew I was righteous by faith, but holy? Come on, I was struggling with sins. How could I be holy? If you visit average church "anywhere USA" or across the globe, you are more than likely to see a banner, hear a song, or a sermon teaching that we must pursue holiness. The implication is we are not currently holy. It's something to attain to, it's not our current state or reality. As usual, religious tradition misses a key point of redemption and the very nature of God. God is Holy and Just and Good. This means sinful, unholy, unrighteous spiritually dead ones cannot stand in His presence or abide in His Heaven. So what can we do? We were lost, we had no standing. Under the Old sacrificial system, the people were covered but still unable to stand in the presence of God. What has He done in the New? He has remade us new and perfectly righteous and acceptable. Think of this, before we could ever stand before Him in love, we would have to be already made holy and blameless in His sight. This means the moment we got saved we became perfectly holy and acceptable to God. This isn't a temporal holiness either. This isn't a holiness that once bestowed can be tarnished and made unclean by our actions. If so, then this Jesus blood and Finished Work isn't much better than the blood of bulls and goats. In His Finished Work, He made us holy once for all time. Because of this, we can't identify as "saved sinners" or "sinners" saved by Grace. No, we were sinners and by Grace, we received perfect salvation and were remade righteous and holy before Him in love. So reject the notion that after you're saved you're still a sinner. When we identify with the risen Christ and who we are in Him we will walk in victory and true freedom. Think of it, Jesus was in all points tempted as we but didn't sin, here. Now Jesus wasn't tempted with sin the verb but sin the noun. Why? Jesus was not born spiritually separated. He was tempted or rather proven and tested that He was pure and spotless and perfect. He had to be in order to be our perfect sacrifice for our sins. He had no sin or fallen nature. Therefore, The temptation wasn't an enticement to sin based upon a desire within. Also, Jesus didn't have a desire to commit wrong but through willpower resisted it. That isn't a true victory. True freedom is not having the desire at all. The enemy had nothing in common with Jesus, He had nothing in Him. No sin nature, no fallen state. Think of this, because of the Finished Work we also are remade new. Perfectly holy, acceptable, righteous and forgiven. Don't listen to the tradition of men that says we still possess a sin nature. We are new creations. Therefore, we too can say the enemy has nothing in us. As Jesus is, so are we in this World. The risen Christ abides within us. In our perfect union with Christ, we partake of His divine nature. All the World, the flesh (old thinking from that old man), and the enemy can do is try to put something on you. Those sins and temptations aren't from the real you. You're holy and righteous. Identify with your new nature, your new right standing, and who Jesus perfectly made you and walk in victory and triumph over sin and addictions. In summation, we are highly valued. He made us new and perfectly holy. See yourself as God sees you. The old has gone and the new has come. We are forever in Him, righteous and accepted and totally forgiven. God isn't mad at you or disappointed in you. You are loved and highly favored and of extreme worth and value do not let anyone take away this truth from you.